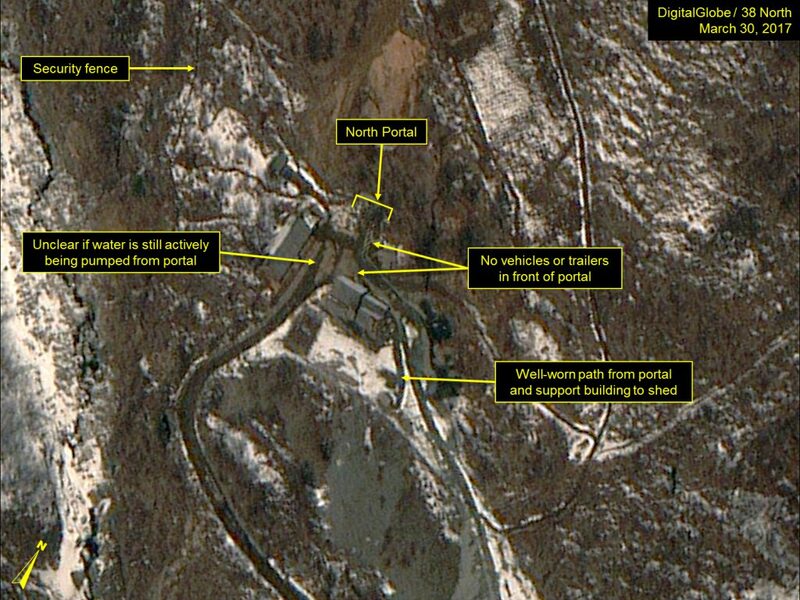 North Korea’s Punggye-ri Nuclear Test Site: Waiting for Godot? 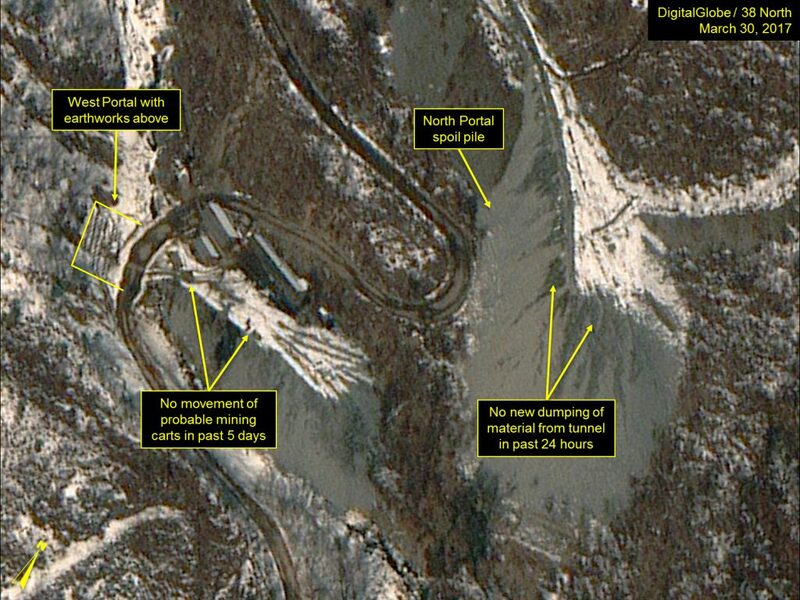 New commercial satellite imagery of the Punggye-ri Nuclear Test Site collected on March 30 shows little change from the previous day. The facility, particularly the North Portal, appears able to support a new nuclear test at any time of the North’s choosing. However, as noted in our last update, great caution should be used in trying to determine if a test is imminent based on satellite imagery alone. At the North Portal no vehicles, trailers or personnel are readily visible. Although water-filled ditches and saturated ground are visible, it is unclear if water is still being actively pumped out of the portal to maintain an optimal environment for instrumentation and stemming. If it is, the flow is less than previously observed, but has not fallen to the level of natural drainage. As suggested by paths through the snow, guards have been patrolling the perimeter security fence. There is also a well-trodden path from the portal and support building to a small shed, the function of which is unclear. No additional dumping of new material removed from the tunnel is apparent on the tailings/spoil pile. Figure 1. No vehicles or trailers remain around the North Portal but well-worn paths are observed. Figure 2. No new dumping of material on the North Portal spoil pile. At the Main Administrative Area, no vehicles, trailers or personnel are observed. Between previous activity in this area and snow melting, both courtyards are clear of snow. What may have been a small collection of crates or trailers seen the day before are no longer present. Figure 3. 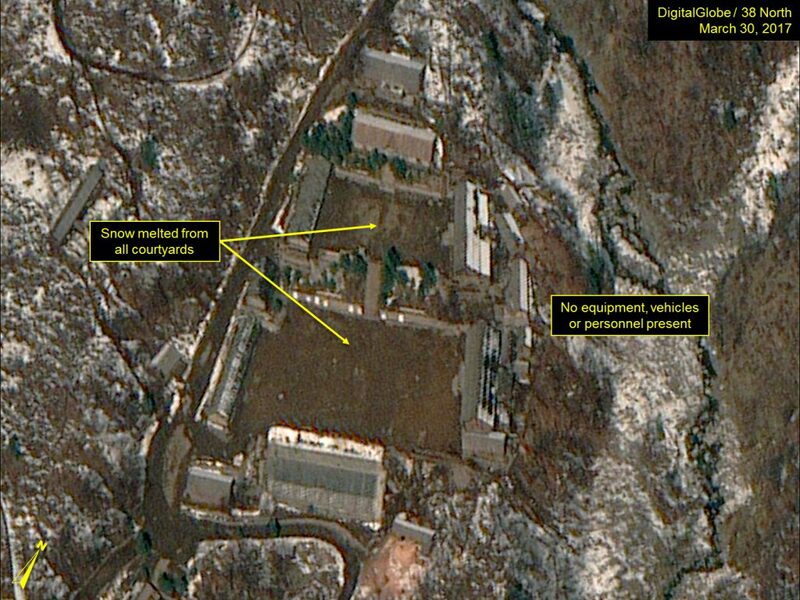 Small collection of crates or trailers seen in previous imagery has been removed. No activity of significance is noted at the West or South Portals. No assessment of the Command Center Area can be made as it is obscured by clouds.